Elevated phosphorus concentrations commonly promote excessive growth of algae in waters nationwide. When such waters are used for public supply, the algae can plug filters during treatment and impart tastes and odors to the finished water. This increases treatment costs and results in finished water that may not be of the quality desired for public supply. Consequently, copper sulfate is routinely applied to many reservoirs to control algal growth but only is a "temporary fix" and must be reapplied at intervals that can range from more than 30 days in the winter to less than 7 days in the summer. Because copper has a maximum allowable concentration in public drinking water and can be toxic to aquatic life, water suppliers commonly seek to develop alternative, long-term strategies for managing reservoirs. Because these are nationwide issues and part of the mission of the U.S. Geological Survey (USGS) is to define and protect the quality of the Nation's water resources and better understand the physical, chemical, and biological processes in wetlands, lakes, reservoirs, and estuaries, investigations into these issues are important to the fulfillment of the mission of the USGS. The City of Newport News, Virginia, provides 50 million gallons per day of treated water for public supply from Lee Hall and Harwoods Mill Reservoirs (terminal reservoirs) to communities on the lower York-James Peninsula. About 3,500 pounds of copper sulfate are applied to each reservoir at 3- to 99-day intervals to control algal growth. 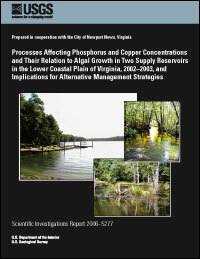 Consequently, the USGS, in cooperation with the City of Newport News, investigated the effects of management practices and natural processes on phosphorus (the apparent growth-limiting nutrient), copper, and algal concentrations in the terminal reservoirs to provide information that can be used to develop alternative management strategies for the terminal reservoirs. Initial parts of the research evaluated circulation and stratification in the reservoirs because these factors affect phosphorus availability to algae. Results indicate that (1) water flows through both reservoirs in a "plug-flow" manner; (2) little water in the lower part of Lee Hall Reservoir, into which pumped water enters, flows into the upper part of the reservoir and mixes with that water; (3) Lee Hall Reservoir generally does not stratify; and (4) Harwoods Mill Reservoir stratifies from April to June through September or October into an upper epilimnion that does not mix with water in the lower hypolimnion. The ratio of dissolved nitrogen to phosphorus concentrations (N:P) for sites in both reservoirs generally was greater than 20:1, indicating that phosphorus likely is the growth-limiting nutrient in both reservoirs. Phosphorus was present predominantly as suspended, rather than dissolved, species except in the hypolimnion of Harwoods Mill Reservoir and the natural inflow represented by Baptist Run. Because Harwoods Mill Reservoir stratified, field-measured physical and chemical characteristics and concentrations of nitrogen and phosphorus species changed sharply over short depth intervals in this reservoir. Dissolved phosphorus concentration increased from 0.015 to 0.057 milligrams per liter between a depth of 15 feet (ft) and the bottom (depth of 18 ft), indicating the release of phosphorus by the decomposition of organic material and(or) the reduction of iron oxides in bed sediment and the lower water column. Because the mixing boundary between the epilimnion and the hypolimnion likely was between depths of 6 and 10 ft, such sources in the hypolimnion would not contribute phosphorus to the growth of algae in the epilimnion from which water is withdrawn for supply until the breakdown of stratification in the fall. Furthermore, laboratory studies of samples from both reservoirs indicated that dissolved phosphorus was released from suspended particles at rates of 0.0007 to 0.0019 milligrams per liter per day. At these rates of release, particles could produce the maximum dissolved phosphorus concentrations measured in the water column within 30 days. Because the Harwoods Mill Reservoir was stratified for 60 to 90 days by the sampling date, more than enough time had passed to produce the elevated concentrations observed in the hypolimnion of the reservoir. This indicates that the release of phosphorus from suspended particles likely is a major source of elevated dissolved phosphorus in Lee Hall Reservoir and the hypolimnion of Harwoods Mill Reservoir. The presence of an upward increasing gradient in phosphorus concentrations in interstitial water in the bed sediment of Lee Hall Reservoir further indicates that the bed sediment is not a major source of phosphorus to algae in the water column. Because of a strong relation between dithionite-extracted phosphorus and iron in the bed sediment, a large part of the phosphorus appears to be bound to poorly crystallized iron oxides in the bed sediment. The ratios of dissolved phosphorus to dissolved iron in samples collected from the bottom of the water column in Harwoods Mill Reservoir, however, were 20 to 290 times the ratio of dithionite-extracted concentrations in the bed sediment, strongly indicating that a source other than bed sediment is the major source of phosphorus to the water column. Part of the need for frequent application of copper sulfate to both reservoirs appears to be the binding of copper to particles (possibly algae and other organic material) and settling of the particles to the bottom as bed sediment. This is substantiated by the presence of more than 50 percent of the total copper in the suspended form in most water-column samples and greater concentrations of copper at depth in both reservoirs even though copper sulfate is applied at the surface in a dissolved form. Settling is further substantiated by the copper concentrations in the bed sediment that ranged from 0.56 to 6.7 milligrams per gram in Lee Hall Reservoir and 1.3 to 7.5 milligrams per gram in Harwoods Mill Reservoir. Furthermore, once copper is in the bed sediment, little copper is released as indicated by copper in interstitial water of box-core samples from Lee Hall reservoir remaining less than detectable concentrations. Concentrations of sulfate in the water column of both reservoirs ranged from 2.5 to 13.8 milligrams per liter. Such low concentration could account for phosphorus not being released from the iron oxides even when dissolved-oxygen concentrations are low in the sediment and overlying water. In the literature, such sulfate concentrations have been shown to limit phosphorus release from bed sediment although the mechanism has not been identified. Because of the short hydraulic retention times of the reservoirs, the release of dissolved phosphorus from suspended particles, and the limited release of phosphorus from bed sediment, the natural and pumped inflows ultimately appear to be the main sources of phosphorus to algae in the terminal reservoirs. Consequently, practices that control phosphorus concentrations in the inflows, not practices such as the application of alum or nitrate that sequester phosphorus in the bed sediment, likely will control algal growth in the terminal reservoirs most successfully. Additionally, the binding of copper in the bed sediment appears to limit exposure of copper to parts of the environment other than those exposed directly to the bed sediments. Although pumping water from outside watersheds directly to the water-treatment plants or through other reservoirs in the Newport News water-supply system, such as Little Creek Reservoir, would reduce phosphorus loads to the terminal reservoirs, these practices cannot be used to reduce phosphorus loads from the natural inflows. Phosphorus in natural inflows likely needs to be controlled near areas where the water flows into the reservoirs because much of the phosphorus likely is derived naturally from nonpoint sources within the largely forested watersheds. For more information, please contact Gary K. Speiran.